Sunday nights have become the equivalent of meat-and-potatoes night around here. Center-cut pork chops were on sale at the Apple Market, and I had bought some potatoes for some reason I can't even remember, so I decided to braise the pork chops and mash the potatoes. I had the Marco Real Tempranillo left over from my beef shanks, so I used that to braise the chops, using my usual method. For the potatoes, I peeled and cubed some russets and boiled them. When they were done, I mashed them up with fat-free milk, adding just a touch of cream and butter. And the vegetable? 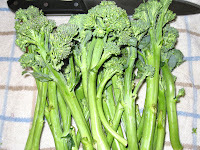 It looks like broccoli, but it's something called broccolette. It was on sale at Treasure Island so I bought a couple of bunches and brought it home. It's something new from Earthbound Farms, but I couldn't find any info on their website. Apparently it's a mix of broccoli and kale. You can see the kale a little in the leaves. Each floret has it's own stalk, which is kind of nice. After washing it, I chopped the stems and left the florets whole. I heated a little olive over medium high heat in a large skillet, then added a diced shallot and a little bit of crushed red pepper. 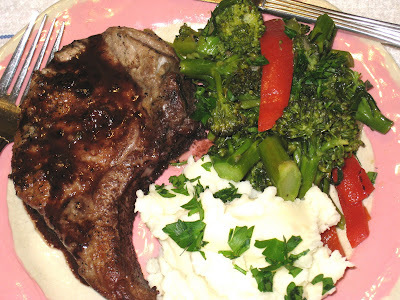 After it had caramelized I added the broccolette and sautee it for about five minutes. Then I added a little bit of chicken stock, lowered the heat, and let it simmer for 10 minutes. At least I meant to let it simmer for 10 minutes. It was more like 15-20 because I forgot to set the timer and I got sidetracked. You can see in the picture how much it was overcooked. But what can you do? I sliced up some of the roasted red pepper I used for the Baked Chicken and Blood Orange with Fennel Couscous and added it right at the end. And while it could definitely have been a bit crunchier, it was absolutely delicious. Keep an eye out for it next time you're at the grocery store. very interesting way to prepare those brocolettes--when's my invite for this tasty?